Jack Ryan is a bit of a strange character for Hollywood. He's the protagonist in a string of two inch thick military/political thrillers written by the late Tom Clancy, and he's been adapted to the screen five times by Paramount Pictures. He was first played by Alec Baldwin in 1990's The Hunt for Red October, then by Harrison Ford in its 1992 and 1994 sequels. Then in 2003 Paramount rebooted the franchise, made the character younger and less experienced, and cast Ben Affleck in The Sum of All Fears. Now in 2014 they've rebooted the character again and cast Chris Pine (Star Trek) as Ryan in Jack Ryan: Shadow Recruit. That's five films, three of which have essentially been origin stories. Talk about redundant. 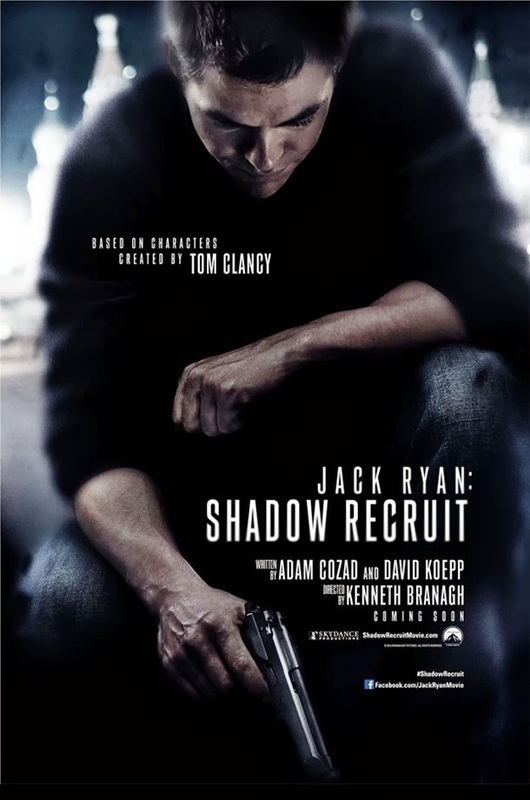 Jack Ryan: Shadow Recruit re-introduces Ryan as an Afghanistan veteran turned CIA stock market analyst, as he uncovers a Russian conspiracy to cripple the United States economy. The film, directed by Kenneth Branagh (who also plays the villain) has already had a fairly disastrous opening in American cinemas. It's made about $30 million in two weeks, and an additional $46 million worldwide, so at this stage it's difficult to imagine Paramount going ahead with a sequel in the near future. I have already blogged about the possible reasons why the film has underperformed (you can read that entry here), but now that I've actually gone and seen the film for myself I figured it was worth giving it a quick review. It's a bit of an odd movie really. It begins with a pretty lengthy and redundant prologue in which we're introduced to the new Ryan, who leaves his PhD studies in London after 9/11 to enlist as a marine. There his helicopter is shot down in a rocket attack, he spends eight months in hospital learning to walk again, meets his future wife Cathy (Keira Knightley) and is head-hunted by CIA agent Commander Tom Harper (Kevin Costner, who amusingly turned down the role of Ryan all the way back in 1989 when they were shooting The Hunt for Red October). The prologue's redundant because it doesn't tell us anything we don't hear about later in the film's main plot. The problem, however, is that if you take it out then Shadow Recruit would probably be less than 90 minutes long. It's an oddly fast, truncated espionage thriller. That said, it is still a reasonably enjoyable film. Certainly the cast is great: Chris Pine plays a good Ryan - better than Affleck, maybe not as good as Baldwin - while Keira Knightley gets a lot more to do than you'd expect. Kevin Costner is great as Harper, but then I'm a big Costner fan and this is the sort of role he does exceptionally well. Branagh plays the villain very well, and does a competent if not exceptionally original job of directing. The most interesting aspect of the film is just how visibly it's been influenced by all of the action-thrillers that have come and gone between The Sum of All Fears and Shadow Recruit. One action scene feels as if it's been lifted directly out of Casino Royale. Another sequence is straight out of Mission: Impossible. Other parts feel like The Bourne Identity. To be honest the climax reminded me more than once of Mimi Leder's underrated military thriller The Peacemaker. I think that may be Shadow Recruit's biggest problem: the earlier Jack Ryan films felt like they were lifted off the page of Tom Clancy's books. This one feels like it's been cribbed from a 21st century action movie cheat sheet. So it's an enjoyable film, but a forgettable one. If Paramount are bold enough to attempt a sequel (and I actually think they should give it a go) I think they really need to go back to the source and loosely adapt another one of the Clancy novels. There is something very entertaining about Clancy's books; a sort of guilty pleasure. They've failed to capture it here, but what they did capture is a solid enough start. Is there a logical reason why Kenneth Branagh directs movies? They're invariably the wrong side of average, he doesn't seem to be building any sort of genuine credibility from them, and he seems to have gone from our generation's Olivier-wunderkind to 'oh, that's guy'. What's going on with him? I can't answer because I don't agree with the basic premise of your question. I really like Branagh's films - admittedly Jack Ryan is work-for-hire and thus doesn't appear to have Branagh's usual flair, but his other films are generally very good. Thor is one of the best of the superhero movies, and his Shakespeare adaptations are particularly strong.